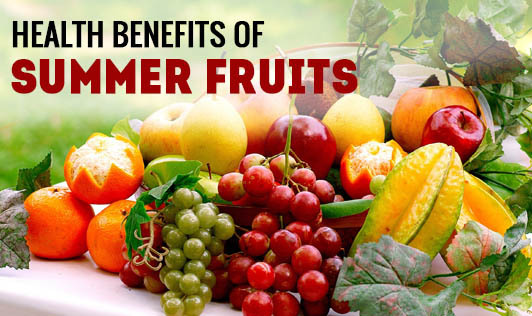 Summer time brings with it a bounty of fresh fruits. Make the most of them when you do spot them, to obtain maximum health benefits. Fruits in general are good for the immune system, digestion, skin, hair and eyes, heart health, circulation, nervous system, respiratory system, the benefits go on and on. So it is vital to include these seasonal foods in your daily diet regime. Mango: It is an excellent source of a variety of antioxidants and nutrients like vitamin C, beta carotene, vitamin A and fiber. Studies have shown that it helps to fight cancer, anemia and other ailments. Berries: One of best varieties of fruits to eat as they are loaded with vitamin C and antioxidants. The phytochemicals in blue berries, blackberries, and strawberries help to boost immunity, and have a protective effect against several types of cancers. Watermelon: It is a wonderful thirst quencher with 92% water and a good source of beta carotene, pectin, lycopene, potassium etc. It helps in energy production, protects against cancer and macular degeneration. Peaches and plums: Contain good amount of vitamin C, beta carotene, anthocyanins etc that help to eliminate the free radicals from the body. Pineapple: Besides being packed with many vitamins and minerals, pineapple contains enzyme bromelain which aids in digestion and helps to prevent the blood clot formation. • Slice melons, berries into your morning cereal to get a healthy dose of nutrients. • Try fresh fruit salad with some flavored low-fat yoghurt as a dessert. • Spice it up with little pepper to make a delicious fruit salad. • Freshly pureed strawberries can make great salad dressings. • Prepare your favorite fruit slush and quench your summer thirst.